Matin Yekta, M., Alavi, S. (2008). New Triterpenoids from Peucedanum ruthenicum. Iranian Journal of Pharmaceutical Sciences, 4(4), 289-294. Marzieh Matin Yekta; Seyed Hamid Reza Alavi. "New Triterpenoids from Peucedanum ruthenicum". 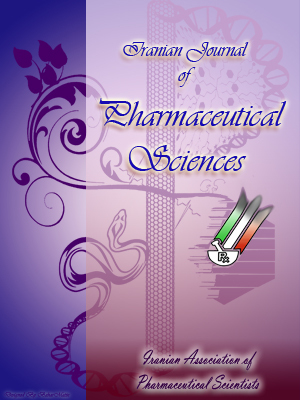 Iranian Journal of Pharmaceutical Sciences, 4, 4, 2008, 289-294. Matin Yekta, M., Alavi, S. (2008). 'New Triterpenoids from Peucedanum ruthenicum', Iranian Journal of Pharmaceutical Sciences, 4(4), pp. 289-294. Matin Yekta, M., Alavi, S. New Triterpenoids from Peucedanum ruthenicum. Iranian Journal of Pharmaceutical Sciences, 2008; 4(4): 289-294. From hexanic extract of aerial parts of Peucedanum ruthenicum M. Bieb (Apiaceae) collected from Mazandaran province of Iran, four triterpenoids namely taraxasterol, y-taraxasterol, poriferasterol and b-sitosterol have been isolated by column chromatography, thin layer chromatography, and crystallization. Their structures were elucidated by spectroscopic methods (UV, IR, MS, 1H and 13C-NMR). There are some 120 species of Peucedanum L. (Apiaceae family) widespread in Europe, Mediterranean region and south, Western and central Asia . Four species of Peucedanum growing in Iran are: P. glaucopruinosum Rech., P. knappii Bornm., P. translucens KH. Rechinger  and P. ruthenicum. They are distributed in Iran , Russia, Europe and Turkey . Sabinene (35.2%), 4-terpineol (26.6%), bcaryophyllene (16.1%) and b-humulene (15.8%) . The major constituents were found to be sabinene and trans-anethole in the leaf and branch oil of P. verticillare. bcaryophyllene, a-phellandrene, cis-bfarnesene and b-bisabolene were found in the dried fruit oil and sabinene in the fresh fruit oil of P. verticillare . In this research, the structures of triterpenoids from the aerial part of P. ruthenicum M.Bieb is reported. The aerial parts of P. ruthenicum was collected in October 2004 from Roodbarak (Mazandaran province) north of Iran and was identified by H. Akhani (Dept. of Plant Biology, Faculty of Science, Tehran University, Tehran, Iran). A voucher specimen is deposited in the private herbarium of H. Akhani (Salimian 39). Melting points were taken on a Reichert-Jung apparatus (Vienna, Austria). Ultraviolet spectra were recoded on a Shimadzu 160A spectrometer (Kyoto, Japan). Electron Ionization Mass Spectra (EIMS) were determined on a Finnigan MAT TSQ 70 (California, USA) at 70eV. ¹H NMR and ¹³C NMR spectra were measured in CDCl3 with tetramethylsilane (TMS) as an internal standard using a Varian 400 Unity plus spectrometer. FTIR spectra were recorded on a Nicolet 550 spectrometer (Madison , WI, USA). Column chromatography (CC) was conducted with silica gel (Kieselgel 60, 60-100 mesh ASTM; Merck, Darmstalt, Germany) and thin-layer chromatography (TLC) with Merck silica gel 60 F254 on glass plates. Dried powdered aerial parts (100 g) of the plant were extracted with methanol by percolation. The solvent was evaporated to give a gummy residue (13.5 g). This residue when treated with 25 ml water, gave a cloudy suspension which was extracted with hexane (3×100 ml). The solvent (hexane) was evaporated and the residue (3.2 g) was chro-matographed on silica gel (petroleum ether/ EtOAc 9:1) and gave 4 fractions. The second fraction was chromatographed on PTLC (diethyl ether, toluene 1:1 saturated with HOAc 10%). From hexanic extract of the aerial parts of P. ruthenicum (Apiaceae), 4 triterpenoid fractions, (Rf1= 0.58, Rf2= 0.62, Rf3= 0.75 and Rf4= 0.78) were isolated by CC, PTLC, and crystallization. The triterpenoids, are: Taraxasterol 1, y-taraxasterol 2, poriferasterol 3 and b-sitosterol 4. The structure of these compounds were elucidated by melting point, UV, IR, MS, 1H and 13C-NMR spectra and by comparison of their physical data with reported in literature (Figure 1). Figure 1. Structure of compounds 1-4 isolated from Peucedanum ruthenicum (Apiaceae). Table 1. 1H and 13C-NMR data of taraxasterol, y-taraxasterol, poriferasterol and b-sitosterol. Compound 1 (taraxasterol): White needle crystal (4.1 mg); Mp 224-226 ºC; EIMS (70 eV) m/z (%): 426 (25), 408 (10), 229 (10), 218 (23), 207 (76), 189 (100); C30H50O; 1H and 13C-NMR, see Table 1 . The mass spectrum of the compound 1 had [M]+ at M/Z 426.7 suggesting the molecular formula C30H50O. The 1H-NMR spectrum of the compound 1 displayed a dd at d 3.22 for the H-3. This is a deshielded proton as a result of OH group. The 1H-NMR spectrum display methylene protons at d 4.60 and 4.62 as two singlet. The same spectrum showed signals for Me-23 at d 0.77 (s), Me-24 d 0.85 (s), Me-25 at d 0.86 (s), Me-26 at d 1.02 (s), Me-27 at d 0.93 (s), Me-28 at d 0.85 (s) and 29 at 1.02(d, J=6.6Hz). The 13C-NMR spectral data (Table 1) showed 30 signals. The peaks at d 154.6 (C-20) and 107.2 (C-30) are related to olefinic carbons. The signal at d 79.0 (C-3) ppm may be related to C-O. Compound 2 (y-taraxasterol): White needle crystal (2.6 mg); Mp 217-219ºC; EIMS (70 eV) m/z (%): 426 (16), 411 (4), 408 (4), 393 (10), 373 (5), 272 (7), 257 (7), 229 (10), 207 (69), 189 (100); C30H50O; 1H and 13C-NMR, see Table 1 . The mass spectrum of the compound 2 had [M]+ at M/Z 426.7 suggesting the molecular formula C30H50O.The 1H- NMR spectrum of the compound 2 displayed a m at SHR Alavi et al / IJPS Autumn 2008; 4(4): 289-294 d 3.19 for the H-3. This is a deshielded proton as a result of OH group. The 1H-NMR spectrum displayed olefinic proton (H-21) at d 5.26 as a distorted doublet. The same spectrum showed signals for Me-23 at d 0.84 (s), Me-24 d 0.85 (s), Me-25 at d 0.86 (s), Me-26 at d 1.03 (s), Me-27 at d 0.95 (s), Me-28 at d 0.73 (s) and 29 at 0.99(d, J=6.6Hz) Me-30 at d 1.63 (brs). The 13C-NMR spectral data (Table 1) showed 30 signals. The peaks at d 139.8 (C-20) and 118.9 (C-21) are related to olefinic carbons. The signal at d 79.01 (C-3) ppm may be related to C-O. Compound 3 (poriferasterol): White needle crystal (2.9 mg); Mp 156-158ºC; EIMS (70 eV) m/z (%): 412 (100), 397 (14), 394 (14), 379 (17), 369 (25), 351 (38), 327 (5), 314 (17), 300 (36), 283 (15), 271 (58), 255 (60), 253 (17), 241 (8), 239 (8), 231 (7), 229 (7); C29H48O; 1H and 13C-NMR, see Table 1 . The mass spectrum of the compound 3 had [M]+ at M/Z 412.7 suggesting the molecular formula C29H48O.The 1H-NMR spectrum of the compound 3 displayed a m at d 3.52 for the H-3.This is a deshielded proton as a result of OH group. The 1H-NMR spectrum displayed olefinic protons(H-22) at d 5.16 and (H-23) at d 5.02. The same spectrum showed signals for Me-18 at d 0.70 (s), Me-19 at d 1.01 (s), Me-21 at 1.02 (d, J=6.6Hz), Me-26 at d 0.85 (d, J=6.4Hz), Me-27 at d 0.79 (d, J=6.6Hz) and Me-29 at d 0.82 (t, J=7.1Hz). The 13C-NMR spectral data (Table 1) showed 29 signals. The peaks at d 138.2 (C-22) and 129.3 (C-23) are related to olefinic carbons. The signal at d 71.83 (C-3) ppm may be related to C-O. Compound 4 (b-sitosterol): White needle crystal (7.3 mg); Mp 135-137 ºC; EIMS (70 eV) m/z (%): 414 (76), 396 (18), 381 (10), 329 (10), 255 (6), 213 (37), 199 (10), 69 (23), 57 (47), 43 (100); C29H50O; 1H and 13C-NMR, see Table 1 . The mass spectrum of the compound 3 had [M]+ at M/Z 414.3 suggesting the molecular formula C29H50O. The 1H-NMR spectrum of the compound 4 displayed a m at d 3.53 for the H-3.This is a deshielded proton as a result of OH group. The 1H-NMR spectrum displayed olefinic proton(H-6) at d 5.36 as adistorted doublet. The same spectrum showed signals for Me-18 at d 0.68 (s), Me-19 d 1.01 (s), Me-21at 0.92(d, J=6.6 Hz), Me-26 at d 0.83 (d, J=6.4 Hz), Me-27 at d 0.72(d, J=6.6 Hz) and Me-29 at d 0.84 brst. The 13C-NMR spectral data (Table 1) showed 29 signals. The peaks at d 140.77 (C-5) and 121.70 (C-6) are related to olefinic carbons. The signal at d 71.78 (C-3) ppm may be related to C-O. This is the first report on the triterpenoids of P. ruthenicum M. Bieb. From hexanic extract of aerial parts of P.ruthenicum collected from Mazandaran province of Iran, four triterpenoids, taraxasterol, y-taraxasterol, poriferasterol and d-sitosterol have been isolated by CC, PTLC, and crystallization were characterized by melting point and spectral data. This research was partially supported by a grant from Iran Chapter of TWAS. Willis J. A dictionary of the flowering plants and ferns. Cambridge: Cambridge University Press, 1968. Pimenov MG. Peucedanum, [Umbeliferae]. In: Rechinger KH, (editor). Flora Iranica. Graz: Akademische Druck-u. Verlagsanstalt, 1987; 162: pp. 442-4. Salimian M. Taxonomic revision of Peucedanum complex in Iran, Thesis for MS degree, Department of Biology, Faculty of Sciences, Tehran University, Tehran, Iran 2003; 97-9. Frey R. Taxonomische revision der Gattung Peucedanum: Section Peucedanum und sektion Palimbioidea (Umbelliferae). Candollea 1989; 44:257-327. Gan WS. Manual of medicinal plants in Taiwan. Taichung: Notional Research Institute of Chinese Medicine, 1965; p. 675. Kong LY, Li Y, Min ZD, Li X, Zhu TR. Qianhu coumarin I from Peucedanum praeruptorum. Phytochemistry 1996; 42: 1689-91. Tang W, Einsehbrand C. Chinese drugs of plant origin. Berlin: Springer Verlag, 1992; pp. 753-7. Liu R, Li A, Sun A, Kong L. Preparative isolation and purification of psoralen and isopsoralen from Psoralea corylifolia by high-speed counter-current Chromatography. J Chromatogr 2004; 1057: 225-8. Soine TO, Zheleva A, Mahandru MM, Erhardt P, Bubeva-Ivanova L. Natural coumarins VII: Isolation and structure of a new coumarin, Peuruthenicin, from Peucedanum ruthenicum M.B. J Pharm Sci 1973; 11: 1879-80. Cisowskiad W, Sawickaa U, Mardarowiczb M, Asztemborskac M, Luczkiewizd M. Essential oil from herb and rhizome of Peucedanum ostruthium Triterpenoids from Peucedanum ruthenicum (L.Koch). ex DC. Z Naturforsch 2001; 56c: 930-2. Danielea F, Lauraa G, Donataa R, Antonioa M. Composition of the essential oil of Peucedanum verticillare. Biochemistry 1978; 28: 143-7. Talapatra SK, Bhar DS, Talapatra B. Dammaradienyl acetate and taraxasterol from Eupatorium cannabinum: Mass spectrometric study of dammaradienyl acetate and its derivatives. Australian J Chem 1974; 27: 1137-42. Bauer S, Schulte E, Their HP. Composition of the surface wax from tomatoes: I. Identification of the components by GC/MS. Eur Food Res Technol 2004; 3: 223-8. Patterson GW, Krauss RW. Strols of Chlorella. I. The naturally occurring sterols of Chlorella vulgaris, C. ellipsoidea, and C. saccharophila. Plant Cell Physiol 1965; 6: 211-20. Khlighi-Sigaroodi F, Hadjiakhoondi A, Shafiee A, Mozaffarian VA, Shahverdi AR, Alavi SHR. Phytochemical analysis of Ferulago bernardii Tomk & M. Pimen. Daru 2006; 14: 214-21.